67" x 71" x 88"
Economical and easy to operate. Our manual and automatic surface grinders offer all of the accuracy of more expensive surface grinders, with the same quality features. 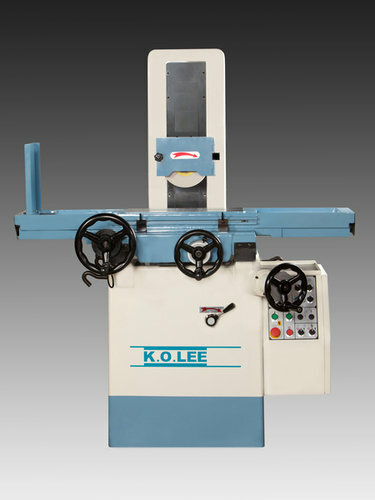 The K.O.LEE High Precision Surface Grinder longitudinal and cross slide ways are precision hand-ground then laminated with Turcite-B. This provides a smooth, even travel with low wear. A full support system maintains accuracy during table reversing and full length of travel. Main components including base, column and saddle, are made of High Quality Meehanite cast iron stress relieved to insure rigid stability. The features also include slip-ring hand wheel dials, a removable cartridge-type spindle with a pair of duplex Class 9 bearings, and dynamically balanced V-3 motor starting at 1.5 HP. Increased HP packages available. LeBlond Ltd’s product support team had collectively 160 years of service with LeBlond Machine Tool Company, LeBlond Makino and Makino. Thus, we have an extensive product knowledge of LeBlond lathes and are here to make sure your LeBlond machines continue to provide the performance for which the LeBlond name is recognized. We maintain $2,500,000 of quality OEM parts to ensure quick delivery and minimize production downtime. 80% of parts are shipped same day. LeBlond Ltd’s extensive documentation means you receive the right parts manufactured to original specifications. We offer technical advice, trouble shooting and can provide field service on-site support as well as new and remanufactured LeBlond lathes.